Photographers and members of educational programs of Fotodepartament Anastasia Tsayder and Anastasia Bogomolova will take part in X international month of photography “Photobiennale 2014”, in Moscow. “Photobiennale 2014” is held in six areas of the city, and 19 exhibitions, basically dedicated to recognized classics of photography, comprise it. Nevertheless, in Moscow Museum of Contemporary Art, the exhibition program of young contemporary artists will be opened in 11 March 2014. Among them are photographer of FotoDepartament Gallery Anastasia Tsayder and the student of FotoDepartament.Institute course Anastasia Bogomolova. Anastasia Tsayder in Photobiennale 2014 will present her project “Russian Interiors”. That is the second personal exhibition of the author: in December 2013 FotoDepartament opened a new place with her first exhibition “Mtsensk”. In whole, “Russian Interiors” continue to develop imagery, laid in “Mtsensk”. On the pictures are interiors of governmental institutions in Karelian small town, in which soviet conservatism neighbors with modernity. Interiors, called Russians, become the reflection of Russian province’s mentality in the project. Anastasia Bogomolova will participate in the exhibition with her project “Dacha/ Garden”, which is made as part of Nadezhda Sheremetova’s course “Post Graduate”. 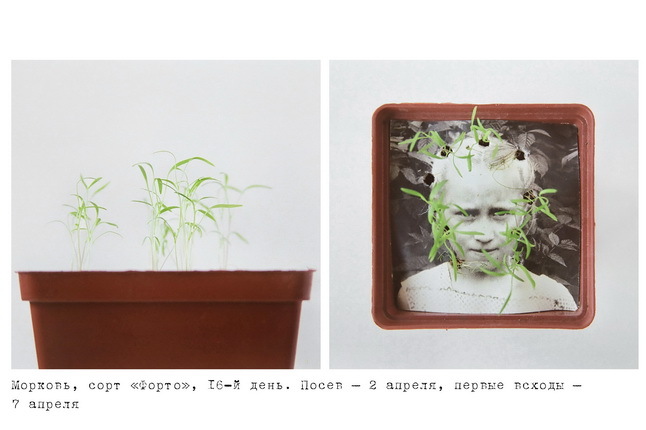 Working on that series Anastasia Bogomolova observed vegetables and flowers growing through the old family photos: alive through knowingly inanimate. The memories about dacha, which was so important to the whole her family someday, had to examine their strength: will carefully expressed tomatoes or memory survive, or… will ground win? Exhibitions will be open for visitors since 11 of March till 20 of April, 2014 in Moscow Museum of Contemporary Art. Detailed timetable of the exhibitions look on the site of main initiator of Photobiennale 2014 – Multimedia Art Museum of Moscow.